Map showing the planned operations area for the expedition outlined in yellow. Image courtesy of the NOAA Office of Ocean Exploration and Research. Download map (pdf, 12.9 MB). From July 12 to August 4, NOAA Ship Okeanos Explorer will conduct a 24-day exploratory mapping expedition to collect critical baseline information about an unknown and poorly understood deepwater priority area southeast of Bermuda identified by the Atlantic Ocean Research Alliance (AORA) Atlantic Seabed Mapping International Working Group (ASMIWG) at the 4th Annual Galway Statement Implementation Committee Meeting in April 2017. This expedition will be the first government-supported, focused mapping survey in support of the AORA/ASMIWG. 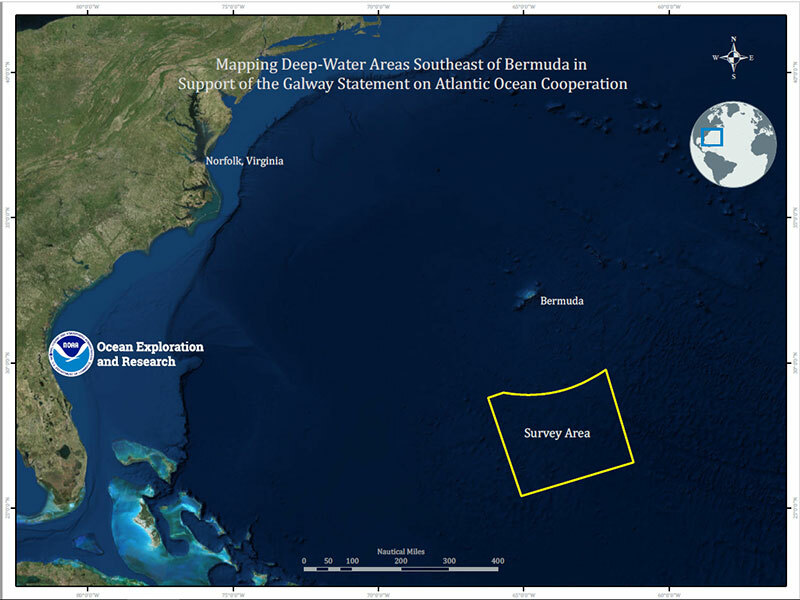 As the first U.S.-led mapping effort in support of the Galway Statement on Atlantic Ocean Cooperation, this cruise will include onboard and remote participation from U.S., Canadian, and European Union students and scientists. Other onboard personnel include three individuals from the NOAA Office of Ocean Exploration and Research’s Explorer-in-Training program, one Educational Partnership Program student, and one individual from the NOAA Teacher At Sea program. As part of the implementation of the Galway Statement , the ASMIWG used a suitability model to identify priority areas in the North Atlantic Ocean, factoring in areas of public interest, sensitive marine areas, and areas with marine resource potential. The 24-hour operations conducted during this expedition will include the use of the ship’s deepwater mapping systems and high-bandwidth satellite connection for hourly data transfer to shore, real-time ship-to-shore communications, and real-time video streaming of sonar screens and the ship's cameras. The AORA: ASMIWG Bermuda Mapping expedition will be the second Okeanos Explorer expedition in support of the AORA Atlantic Seafloor Partnership for Integrated Research and Exploration (ASPIRE), a major multi-year, multi-national collaborative ocean exploration field program focused on raising collective knowledge and understanding of the North Atlantic Ocean. Building on the successes of the 2012-2013 Atlantic Canyons Undersea Mapping Expeditions (ACUMEN), the ASPIRE initiative will broaden its geographic focus to include more of the U.S. Atlantic and the high seas and the scope of partnerships to include federal agencies, such as the Bureau of Ocean Energy Management and the U.S. Geological Survey, as well as international partners from the European Union and Canada.